Jobu University, representing Kankoshin Student Baseball Federation, won the first national title after their 12 attempts by narrowly defeating Asia University of Tohto University Baseball League 6-5 on June 16 at Meiji Jingu Stadium in Tokyo. 26 Regional Champions of University Baseball joined the 62nd National Championship held at Tokyo Dome and Meiji Jingu Stadium for 6 days from June 11. Manager Hidenori Taniguchi, associate professor of Jobu, is a familiar figure among amateur baseball community in Japan, used to play at Toshiba and was a National Team member for 1994 IBAF World Cup. 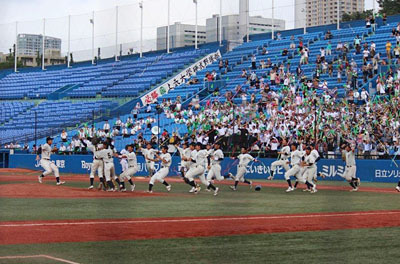 At the closing ceremony, Meiji Jingu Stadium was awarded Special Recognition by the All-Japan University Baseball Federation (JUBF) for maintaining the ground in good condition in spite of the successive trying weather in the midst of the rainy season. Tetsu Yokota of Jobu was chosen MVP as well as Best Pitcher with 4 wins and ERA 2.12. Leading Hitter was Kento Itohara (6 for 12, .500) of Meiji University which lost to Jobu 4-3 at the semi-finals. In 3 weeks, from July 6 to 11, the Japanese and U.S. National Collegiate Teams will meet at the IBAF sanctioned 39th Japan-US Championship in Matsuyama, Hiroshima, Utsunomiya and Tokyo, Japan. The bi-annual Championship that started in 1972 has been won 22 times by the U.S. and 16 by Japan.